tl;dr: with adapter.js you can write WebRTC code that is spec-compliant and works in all supported browsers. That is the web we want. We have come a long way since WebRTC was first enabled by default in Nightly back in February 2013 after interoperability had been achieved earlier that month. Since then a lot has happened. One of the bigger updates to the specifications was the addition of a Promise-based version of the API instead of callback-based API in December 2014. Firefox has supported the Promise-based versions of the getUserMedia and the RTCPeerConnection APIs for quite a while now. Yay! Back in June, Apple introduced bitcode as a part of their app thinning strategy, which allows them to implement some optimizations in the future without developers having to resubmit their apps. Unfortunately, bitcode must be enabled for the whole app, including third-party libraries. This is a problem if you use WebRTC as it does not currently have a build option to enable bitcode. Because the Talky iOS app uses WebRTC, I decided to investigate what it would take to enable bitcode when building WebRTC. For this post, I assume that you're building a Release build of WebRTC with the steps outlined at http://www.webrtc.org/native-code/ios. If you haven't already downloaded the WebRTC source, open a terminal window and follow the steps for "Getting the code". It’s been a while since I last wrote about testing WebRTC applications. And guess what? There has been some progress. We’re now using Travis-CI for integration tests in combination with Selenium for UI testing. The usage of Travis-CI has been described quite a while ago by our rtc.io friends. It is now being used by adapter.js which has recently become a dependency of our core modules like getUserMedia and RTCPeerConnection since it shims the differences between browsers and is maintained by people from Google and Mozilla. 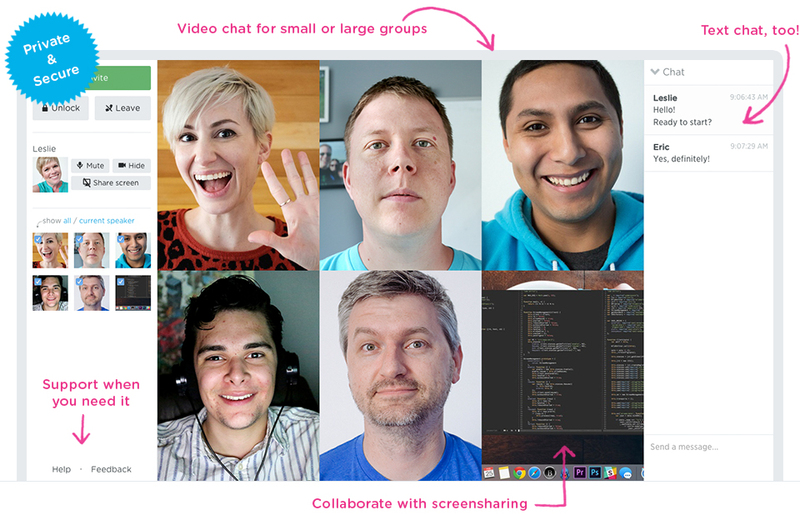 A few weeks ago we talked about the need for private video chat and the challenges involved with making that a reality in a cloud-based environment. That’s why we’ve been working hard to build a version of Talky you can run on your company’s network to keep your voice and video traffic safely away from the public Internet. We’re proud to announce that Talky On-Premise is now available. Talky On-Premise takes the same ultra-simple experience you’ve come to love for video chat over the Internet, and moves it in-house. The installation is almost as easy as using Talky in the first place and the price is surprisingly affordable (as we like to say, the only thing astronomical about Talky is the rocket game, Lander). tl;dr download the Windows 10 preview and test the WebRTC getUserMedia samples in the Microsoft Edge browser! The WebRTC samples that are made available by Google's WebRTC team on GitHub are a tremendously useful resource for starting with WebRTC. They are so useful that this year my favorite answer on the discuss-webrtc mailing list has been "there is a sample for that". RTCDataChannel samples which demonstrate the higher-level data channel API to send and receive data and files. One of the greatest lessons we can learn from watching internet platforms and applications grow in popularity is how crucial users' safety can be in utilizing those services. The safety of our Talky users is extremely important to us. In keeping with discussing the security and privacy of our service, we also want to share our best practices for safety when using Talky. Below are some tips you can use to help ensure that you have great conversations with the people you choose, and avoid stumbling upon explicit, unwanted content. By default all rooms within Talky are public. When two or more people land on the same link they will be connected with video and audio streaming to each other. Sharing a link to a Talky room via Twitter or Facebook is essentially inviting everyone else. To avoid having an Internet party with strangers, only share links via direct messages or other private methods of communication. Lead &yet WebRTC engineer Philipp “fippo” Hancke has been very busy recently examining the inner workings of some of your favorite voice and video services. Just a few weeks ago, he wrote up his findings on the popular chat app WhatsApp for webrtcH4cKS. And this week, we have an analysis of Facebooks Messenger service, which recently added videochat. You can also follow the series of reports at andyet.com/webrtc-reports. Later this month, he’ll be speaking candidly about more of his discoveries at Twilio’s SIGNAL Conference in San Francisco. In “WebRTC exposed: What we can learn from blackbox exploration of popular voice & video services” fippo explains the findings as well as the lessons that can be learned for WebRTC. If you’ll be at SIGNAL be sure to ping fippo) or Peter to say hello! WebRTC and ORTC live together in perfect harmony side by side on my laptop keyboard Oh, Lord, hopefully...? And the WebRTC Platform of the Year Award goes to... Chrome! I see all these webrtc product of the year awards... And here I am wondering how come Chrome has not won one yet. User experience is very important to us. Almost a year ago, Chrome changed the way screensharing works in WebRTC in a way that increased the usage for Talky by 300%. Still, the onboarding process for your first screen share was not as nice as it could have been. It used to be, if you tried to share your screen, you were required to install an extension. Once that extension was installed, you would have to reload Talky before you could share your screen. Until today, it was also necessary to click the "Share Screen" button again after the reload. Now, after you've installed the extension, you're able to screenshare immediately, making the first-time experience faster and easier. Firefox is starting to roll out Firefox Hello to more users. Hello is a videochat, very much like our own Talky. In the WebRTChacks analysiѕ, I described it a small button to your browser that generates a call URL which you can share. When launching our Talky videochat service almost two years ago there was one thing missing: the TURN server. WebRTC creates peer-to-peer connections between browsers to transfer the audio and video data, but sometimes it needs a little help to establish a connection. The TURN server is the thing that helps here: it is deployed on the Internet and relays data for two clients that fail to establish a direct, P2P connection (thus avoiding the dreaded "black video" problem). TURN is generally considered one of the hard topics when people start doing WebRTC and crucial to running a successful service. When I started at &yet back in March one of the first things I did was to add a TURN server. We choose the open-source restund server because it had proven to be mature and very easy to extend earlier. The rfc-5766-turn-server is another popular choice here, but the design and extensibility of restund was more appealing to us. In response to adding a TURN server, the number of "black video" problems that users reported went down to almost zero. The exception were Firefox users and this turned out to be a Firefox bug which was fixed.